This post will deal with The Inclusive City Game Talk Show held on the 23rd of November 2016 at Wijk & Co. in Utrecht Overvecht. 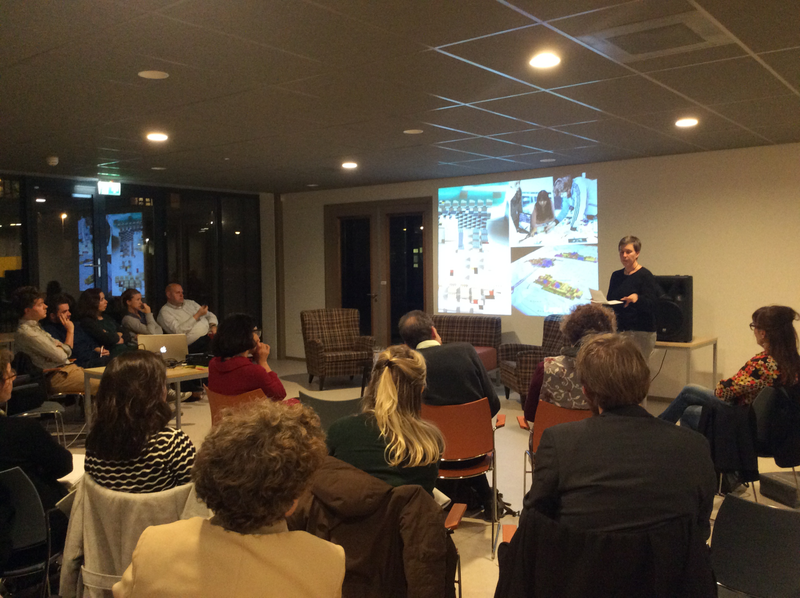 Like the preceding event in Amsterdam, the talk show was moderated by Utrecht University’s Michiel de Lange and it brought together local and national experts (such as municipal workers or representatives of local initiatives) and game designers. Unlike the previous event, the focus was on localizing the more general background of creating city games for newcomers in the environment of Overvecht. The talk show took place during the game jam of Games for Cities as well, thus the evening functioned as a dialogue with local experts, an initial presentation of game ideas and a chance to comment on their design. Sketching the general background were Michelle Provoost and Nina Hälker. Finally, Ekim Tan was present to discuss the game jam game design process. Due to the more specific localization of a neighborhood (instead of the whole of Amsterdam) the focus of this talk show was on how games can be used to approach an influx of newcomers in a specific neighborhood. This report shall discuss the ideas presented in this talk show to reflect on the role of games in dealing with an influx of newcomers. This is done by first sketching what games can achieve in general and the gradually localizing these capabilities in the context of Overvecht. This will be done by giving some background on Overvecht, chronicling Michelle Provoost’s talk on why games should be used in cities, observing examples and consequences of games in the newcomer issue as sketched by Nina Hälker, and finally reflecting on these ideas in relation to Overvecht as spurred by the dialogue between Ekim Tan and the local audience. In order to gain more insight into how the particular social issue of housing and integrating newcomers can be addressed through games, the capacities of games should be outlined. This way the goals to be pursued by possible games can be demarcated. The arrival of newcomers into cities is a complex topic. Games are however not a completely random approach to such complexity. According to Michiel de Lange, games can facilitate complex urban issues in several ways. “[G]ames may be used to engage people in the actual planning and design process itself through simulation, feedback and using outcomes in actual design” (de Lange 2015, 430). “[G]ames are used to stimulate playful encounters and interactions with other people and places by stimulating serendipity and fun” (idem, 432). “[G]ames are used to foster a “sense of place”, a feeling of belonging and care for the city through emotionally powerful play experiences” (ibidem). Giving newcomers a voice in the actual neighbourhood design, or asking locals to help in the planning contributes to a feeling of ownership among citizens – “a sense of responsibility for shared issues and [the ability to take] action on these matters” (de Lange & de Waal 2013). Games can then prevent imposing unwanted measures that further alienate the neighbourhood from its residents. The social, experimental and emotional ties evoked through games can help tie newcomers to their new home as well as visualise the present opportunities for inhabitants. Games, as such, seem to be a very useful tool that can address nearly everyone and everything, and be meaningful to boot. An example of such use of games can be seen in Boston, Massachusetts. The Engagement Lab @ Emerson College used a Second Life clone, Hub2, to involve citizens in the planning of a neighbourhood park. This game saw youngsters engaged with the planning process and gave the space more local meaning. As Eric Gordon and Edith Manosevitch put it: “Rather than relying on information from outside experts, [participants] were able to create and share local experiences. Experiences of the park space, not the idea of the park space, were the instigators of conversation” (2010, 89). Based on this example, games can be used to involve new people, characterise a place, inform design decisions, and foster more experimental exploration. These are all general consequences of games for cities, but how do these effects hold up when contextualised in a local environment? 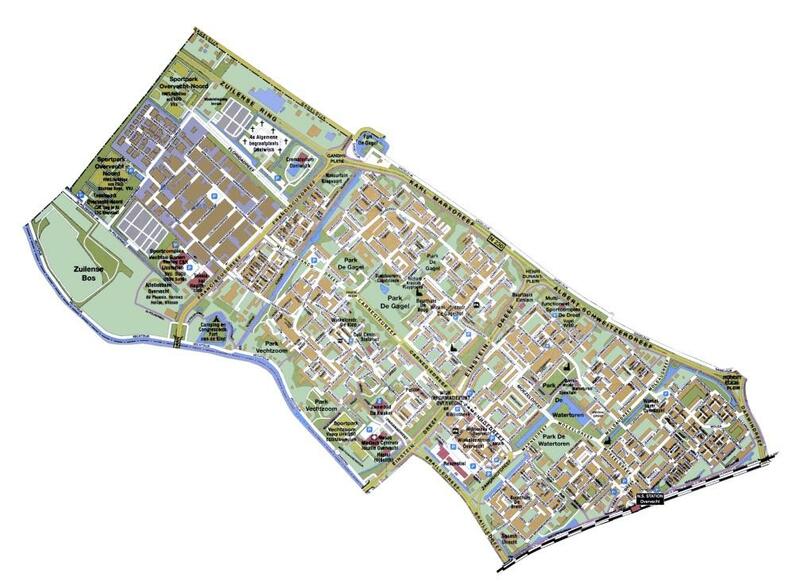 First, the specific environment of Utrecht’s Overvecht neighbourhood will be outlined in the following section. In the northeast of Utrecht lies the district of Overvecht. Built after the Second World War, Overvecht is one of the ten districts that comprise Utrecht. Next to bordering on large nature areas, Overvecht is the greenest district, as well as the district with the most sport facilities. However, Overvecht has a negative reputation, with residents grading it with a 5.6 (Wertwijn et al. 2016, 5). It copes with unemployment, a higher percentage of residents with declining health, youth delinquency and criminality. Many local initiatives and campaigns now focus on improving housing, employment, health and safety. Another characterizing element of Overvecht is that it has a relatively high amount of social housing. This makes it an appealing district for newcomers to Utrecht. The many students, migrant workers, refugees, but also reintegrated delinquents flock to the many large apartment buildings of Overvecht due to its low prices. 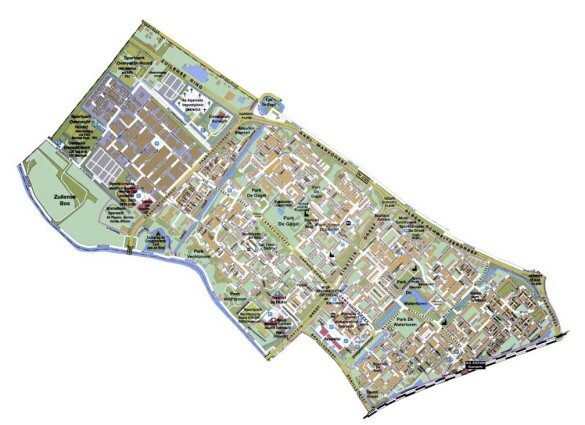 As a result, a local expert claims that in the whole of Overvecht there live about 170 different nationalities (in contrast: the whole city of London houses about 180). Overvecht is then home to a very multicultural public that is constantly coming and going. This dynamism, as well as the abovementioned problems can make it hard to feel at home in Overvecht, where despite its diverse population opportunities remain limited and social cohesion, graded with a 4.8 (Wertwijn et al. 2016, 5), is relatively low in the isolated apartment condos. As more and more newcomers – the most recent ones being refugees – come to Overvecht, the carrying capacity of the neighborhood is stretched and the inclusivity is tested, sometimes resulting in violence. With this overview of game capacities and the application context in mind we can start to ponder on how can games even begin to help in this. The talk show highlighted two sides of this phenomenon: the possible games used to model this, and the topic of coping with newcomers. 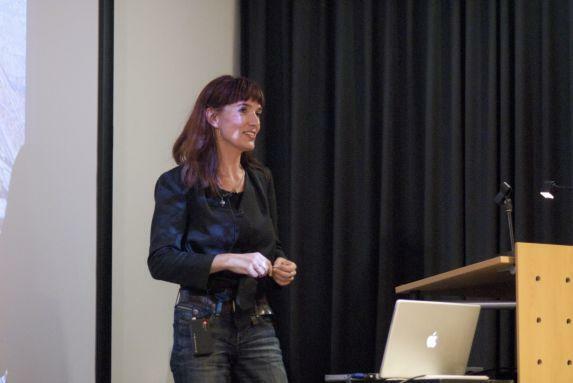 The latter was first addressed by Michelle Provoost. Afford participation of the newcomers. As illustrated in this overview, to properly address the complex topic of newcomers in contexts such as Overvecht, only one out of five of these characteristics can be approached through games. Games can help enable participation through role plays, level playing fields and experimental, safe settings. Despite these capabilities, designers must consider that games operate in a particular milieu wherein housing reigns supreme. How can games function within this milieu in that case? A remark from the audience was enlightening in the respect. This local expert observed the focus in Provoost’s overview on housing and instead suggested a focus on homes. Having a house and feeling at home are two different things. Feeling at home happens through a social network that provides opportunities, and a general sense of meaning associated to a place. Play and games, according to Miguel Sicart can “make a space that is not supposed to be personal [into] a new environment for expression and collective and individual identity (2016, 31). Following the characteristics of play outlined by De Lange and focusing on the fostering of a social opportunity network, games can indeed help prepare the city for newcomers, but only by providing opportunities for participation that facilitate meaning making as well as interaction in the city. Games and play do not address other necessary issues like housing however.. The second speaker left the political realm of newcomers behind and instead focused on existing games that have already engaged with this issue. This gave the audience an idea of what already happens in the games for cities domain and they could probe the effects. Nina Hälker, research assistant from the Hafencity Universität in Hamburg, discussed the Hamburg initiative of FindingPlaces, a game commissioned by the Hamburg municipality. Relying on the CityScope technology, this initiative allowed citizens of Hamburg to playfully help the municipal government in identifying suitable locations for arriving refugees. Using a projection of Hamburg on Plexiglas, citizens could explore characteristics of buildings and with specialized LEGO blocks indicate suitable places. These places were then communicated to the municipality for consideration. By playing citizens could participate in the facilitation of housing newcomers. Through this system 2300 places were identified as suitable, but the municipality only accepted 44 and currently six are seriously considered (although these are currently uncertain as well for people living around the identified places protested). What this shows is that games can help in making citizens participate in urban issues but the actual results have to be nuanced. Hälker did not abandon all hope however. While the games do not directly influence the newcomers, the game did foster new debates on parameters for refugee housing, dimensions of resistance and unfamiliarity. Summarised, it provided an overall more complex view of the city. Indirectly then, games can affect the newcomer issue, but only by fostering participation in larger debates instead of providing solutions by themselves. Games are always contextualized in multiple systems which temper their efficacy. At this point in the evening the participants were familiarized with the particulars of the newcomer issue, the reach of the efficacy of games, and some of their effects. What remained was a more dialogical reflection on the games designed to played in the context of Overvecht. Having received these perspectives on what games can be used for and their limited reach, Ekim Tan was the last speaker of the talk show, and gathered comments, pitfalls and advice when designing games for Overvecht from the audience. Throughout the day, Tan had participated in a game jam with the sole purpose to design a game for Overvecht that would make its inhabitants – new or settled – feel at home. Tan presented the data on which she and her fellow designers based their expectations of the game. Key in these considerations was addressing what residents have to offer Overvecht and vice versa. This focus was divided into four topics that were outlined as key focal points in the acceleration plan: housing, employment, health, and safety. To give the game designers the best chance at creating a useful game the audience was asked to identify the most fruitful goal and audience to be pursued through games. In the ensuing plenary discussion, the audience stressed that Overvecht is characterized by a large number of international residents that do not necessarily participate with initiatives because they are either unaware or lack motivation. To fully realize the participation focus, many local experts recommended that involving the playing residents in the creation of the game or in a large part of their functioning is key. Not only does this facilitate participation, it also allows citizens to experience ownership of their neighborhood through the game, which is useful for newcomers to feel at home. In order to do this however the games should not impose desired behavior on the players. Initiatives that for instance invite residents to participate in policy making only appeal to a very small portion of the citizens, mostly not the newcomers. These highly structured meetings do not fit the intended audience. During the closing discussion local experts stressed that in order for games to appeal to citizens they need to engage with the daily experience realm of the citizens. In a neighborhood with 170 different nationalities, this may differ a lot. Therefore, the local experts suggested something in line with game design theories. Sicart calls play “appropriative” in the sense that “it wants to take over the world in order to manipulate it” (2016, 28). This means that when playing a game the exact result it has on the play session is not yet determined. Every player will manipulate the rules and the objects differently to create a situation that is personally pleasing. Keeping this in mind, the local experts suggested creating a lot of leeway in the games for citizens to add their own cultural or personal preferences. This way language, motivation, and cultural barriers are evaded and personal experiences are ensured. The focus is on player stories instead of static game structures. This personal adaptability is a key element in games for cities in Overvecht. These points mean that games for cities have to tread a careful balance: They either strive for very specific goals or relinquish control to involve more and different publics. The next pertinent question is how to get citizens and especially newcomers to play. Addressing cross-cultural appeals such as food or sport may offer insight in this matter but regardless of these elements games for cities are the most locally specific of all games while simultaneously leaving very much to be filled in. Gordon, Eric, and Edith Manosevitch. 2011. ‘Augmented Deliberation: Merging Physical and Virtual Interaction to Engage Communities in Urban Planning’. New Media & Society 13 (1): 75–95. Provoost, Michelle, and Wouter Vanstiphout. 2015. ‘City of Comings and Goings.’ In Landscape Architecture and Urban Design in the Netherlands Yearbook 2015. Edited by Mark Hendriks, Martine Bakker, Marieke Berkers, Rob van der Bijl, Marc Nolden, Peter-Paul Witsen. Wageningen: Blauwdruk.